Personalisation, more than a business solution! Offering advanced features to an ever-growing pool of international clients is the purpose that drives Retargeting every day and what makes our tool a complete marketing solution for online shops. And since Retargeting.biz keeps on evolving and investing in order to get better and better, it’s no wonder media outlets all over the world noticed and wants to know more about the founder and CEO, Rares Banescu, and the force behind the technologies that we offer our clients, the Retargeting.biz team. We are proud of our work and our team. So it comes as no surprise that we created this post to show you just how much. We would like to share with you the latest articles about Retargeting.biz. 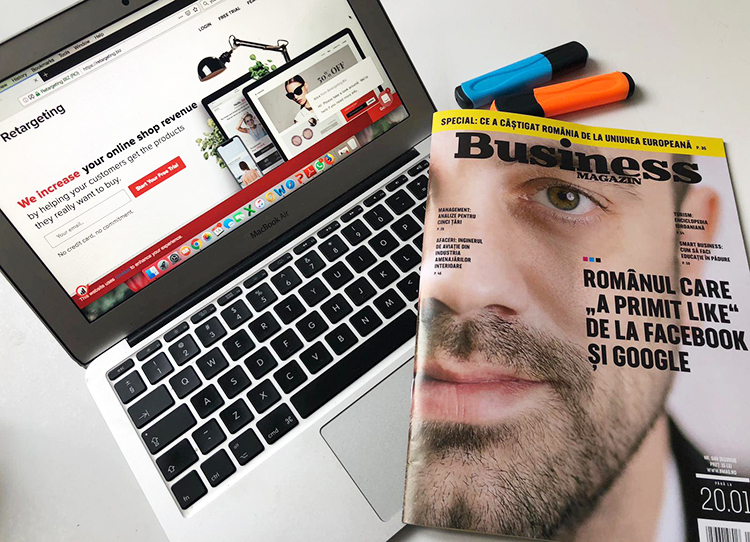 And we would like to start with the cover of Business Magazin, a Romanian publication dedicated to entrepreneurs that featured our founder and CEO, Rares Banescu. The article is an overview of Retargeting.biz’ history, achievements, future projects, but also a little bit about Rares’s path as a businessman. E-commerce is an industry that keeps on growing, reinventing itself all the time, so you always have to adapt and learn in order to stay relevant. And since Retargeting.biz is a marketing automation solution for online shops, it has to do the same. The team has everything from sales and marketing experts, to excellent customers support and developers in order to manage all our clients’ needs and offer them more and more options to skyrocket their online businesses revenues. It goes without saying, that if a business does not evolve, it gets left behind. This fact has never been truer than nowadays, especially in a constantly growing market like e-commerce that heavily relies on technical developments. And, this begs the question — How do online businesses serve and retain diverse potential customers? 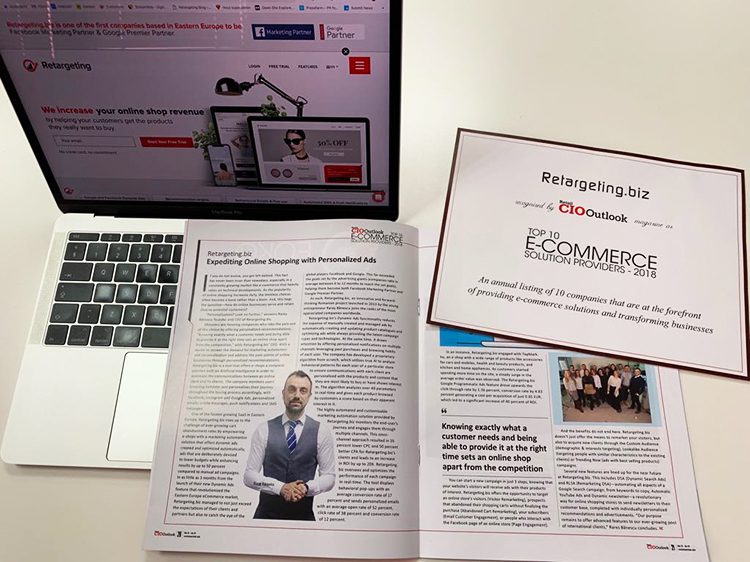 said Rares Banescu in his interview for Retail CIO Outlook, a prestigious publication, that featured Retargeting.biz in the Top 10 E-COMMERCE Solution Providers – 2018. Launched 5 years ago by the Romanian entrepreneur Rareș Bănescu, the start-up Retargeting.biz, has become nowadays one of the fastest growing SAAS in CEE due to the enthusiasm and determination of the whole team. In as little as 3 months from the launch of their new Dynamic Ads feature that revolutionized the Eastern Europe eCommerce market, Retargeting.biz managed to not just exceed the expectations of their clients and partners but also to catch the eye of the global players Facebook & Google, far exceeding the goals set by the advertising giants (companies take on average between 6-12 months to reach the set goals), becoming both Facebook Marketing Partner & Google Premier Partner. And the future is looking even better. Several new features are lined up: DSA (Dynamic Search Ads) and RLSA (Remarketing DSA) – automating all aspects of a Google Search campaign, from keywords to copy, Automatic Youtube Ads and Dynamic newsletter – a revolutionary way for online shopping stores to send newsletters to their customer base, completed with individually personalized recommendations and advertisements.